Are Flying Robots the Next Smart Grid Technology Ready to Take Off? Unmanned aerial vehicles (UAVs) come in all shapes and sizes -- and they’re not all like the missile-equipped drone aircraft in use by the U.S. military. A new breed of tiny, battery-powered flying robots are performing all kinds of non-lethal tasks, from trade show package delivery demos for Amazon, to flying over solar farms to look for maintenance problems. 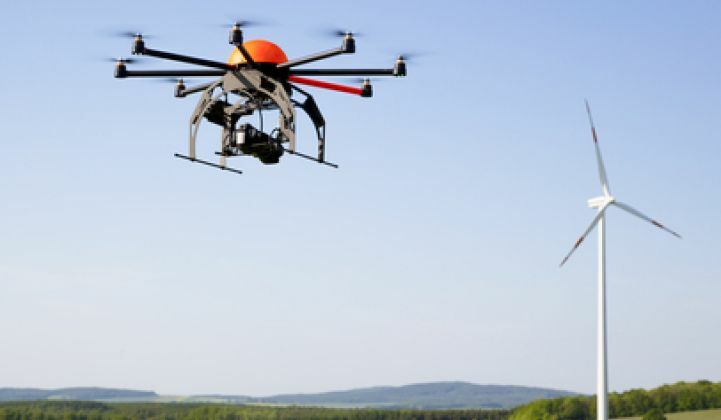 Utilities are another natural fit for UAVs. They have thousands of miles of transmission lines to inspect every year, many of them stretching over untracked mountain and desert terrain that require expensive helicopter flights or time-consuming ground crew hiking expeditions. A fleet of flying robots could cover the same territory at a fraction of the cost. UAVs also have a fraction of the risk for certain utility tasks -- say, climbing a transmission tower to inspect high-voltage electrical equipment, or checking a power line that’s being threatened by fire. While they can’t actually fix things themselves, UAVs could be very valuable eyes and ears for utilities across a range of use cases. So why haven’t utilities started using drones yet? The main roadblock to date has been the Federal Aviation Administration. While private property owners can fly tiny robots at close to ground level without FAA clearance, utility infrastructure is out there in the public airspace. Flying anything in that airspace comes with an exhaustive list of FAA requirements. 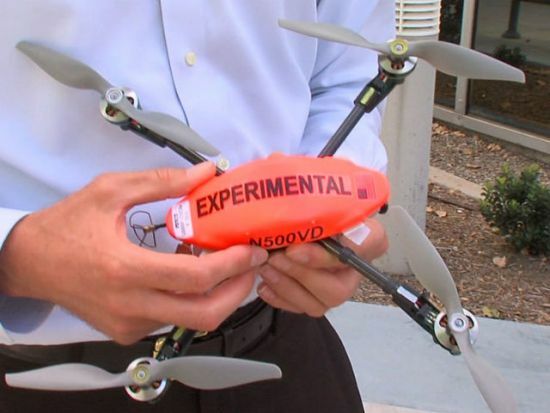 Earlier this month, San Diego Gas & Electric quietly became the first utility in the country to take on this challenge, launching a pilot program under an FAA “special airworthiness certificate.” Over the coming months, SDG&E will be flying a pair of UAVs along a half-mile-wide, 2.5-mile-long stretch of transmission line right-of-way in remote eastern San Diego County, in hopes of proving that flying robots are safe and effective tools that could eventually be put to use across its territory. SDG&E has already started test-flying its two UAVs, which weigh less than a pound and are built by Massachusetts-based contract R&D firm Physical Sciences Inc., utility spokesperson Hanan Eisenman said in a Friday interview. “The purpose is to promote safety and reliability,” said Eisenman. “This device can inspect power lines, help identify power outages more quickly, and improve situational awareness in fires. It can also inspect gas lines," which is something of interest to Sempra Energy, parent company of both SDG&E and Southern California Gas. Cost reduction is another huge benefit. SDG&E’s entire UAV system, including two “quadcopters” and a control panel, cost about $6,000, he said. Compare that to the costs of helicopter flyovers for tasks like tracking vegetation growth along transmission lines, which can add up to hundreds or thousands of dollars per mile. Of course, SDG&E’s current tests include costs beyond the price of the UAVs. Right now, SDG&E has hired licensed pilots to operate the UAVs in flight, as well as a “registered pilot observer” to monitor each outing, he said. That’s part of the FAA agreement to build a record of evidence of how well the UAVs handle in their set of tasks. For instance, SDG&E would like to see if the quadcopters can fly in wind conditions that would ground helicopters, such as during California’s seasonal Santa Ana winds, he said. It would also like to put them to use for firefighting tasks, to augment its existing weather forecasting and firefighting information coordination system, said Eisenman. There’s a catch here, however. Right now, SDG&E is only operating its UAVs in line-of-sight mode, with each vehicle always in sight of the pilot flying it, Eisenman said. That’s also part of the FAA agreement, and SDG&E isn’t yet talking about how it might start testing the UAVs in situations where the operator can’t actually see it. “These things do have a camera on them, that sends a live feed to the control panel, so the operator can send them up, and get close to those transmission towers and inspect them in real time,” he said. This, of course, is sure to raise privacy concerns. Eisenman noted that the current test site has no homes or businesses, and that SDG&E has no intention of using UAVs in populated areas. The electric utility industry has been testing robots for transmission line inspection for some time now, but they’ve mainly been crawler-type devices that ride on the power line itself. Flying robots are far more flexible, and startups like SkyCatch are designing platforms that make deploying them quite simple. Perhaps the smart grid will be airborne sooner than we think.